Age of children:At Farnley Nursery we care for children between 3 months and 5 years. This magical nursery is nestled in the beautiful village of Farnley, North Yorkshire. Situated amongst the trees, our location provides us with fantastic links to nature, both indoors and out. 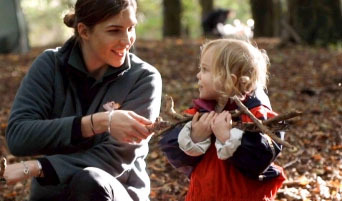 Our ethos at Chapter One is to bring outdoor adventure and learning to children’s early years and being situated in these beautiful grounds, gives us great opportunities to explore, investigate and play, right on our doorstep. We believe taking learning outdoors gives children the opportunity to learn in an ever-changing environment. Colours, temperature, textures and sounds within the outdoor classroom change daily, creating a more sensory and stimulating learning experience. Split placements are available with Treetops, our outdoor nursery. All childcare vouchers are accepted, including tax free childcare. We are in partnership with North Yorkshire County Council and offer funded places for 2, 3 and 4 year olds. The Acorns – This room accommodates children 3 months to approximately 15 months. This room has wonderful sensory elements and heuristic play resources to stimulate those little developing minds. The Sycamores – This room accommodates children from 15 months to 2 years. This room has large spacious areas for gross motor skill development from crawling and walking. It has a giant indoor sand pit and lots of play areas for the little explorers. The Willows – This room is designed for children aged between approx. 2 – 3 years and consists of a giant indoor sand pit, a messy area for arts and crafts, a quite reading area and much more. The Oaks – Our Oaks room is for the oldest children in the nursery, approx. 3-5 years. This room contains core resources for pre-school children all day to ensure they experience lots of play and learning opportunities so they become confident individuals for their onward journey to school. Pyjama Drama – At Chapter One, we are lucky to be able to offer these exciting drama workshops. Drama not only improves communication skills but it also builds confidence and develops creative thinking which is incredibly important in children’s early years. All food and refreshment are home cooked onsite by our own chef and are included within the fees. Breakfast - selection of cereals. Morning snack - fresh fruit and milk. Lunch - Daily fresh meals such as – healthy pasta dishes, rice dishes, mild chilli and paella followed by yoghurt, berries and purees. Afternoon snack - comprising of sandwiches, veggie sticks and dips and fresh fruit. We are open from 7.30am – 6.00pm Monday – Friday 51 weeks of the year only closing between Christmas and New Year and the following public holidays; New Year’s Day, Good Friday, Easter Monday, May bank holiday, Spring bank holiday, Summer bank holiday, Christmas Day, Boxing Day. Split placements are available offering the opportunity to take daily places within the outdoor nursery and half day or full day places within our indoor nurseries.